Maltose binding protein (MBP) is a common protein expression tag. Originally developed by NEB in the late 1980’s, it is one of the most well-known and accomplished means of tagging proteins expressed in microbes. Fusion of a target protein to MBP permits its one-step purification using amylose resin. Additionally, in E. coli, MBP is known to have significantly enhanced the solubility of many proteins it has been fused to. The pMAL™ Protein Fusion and Purification System (NEB #E8200) allows researchers to use E. coli to create a fusion between an expressed target protein and MBP, and purify the fusion protein in a single step. A gene of interest is cloned into a pMAL vector downstream of the malE gene that encodes MBP. The strong Ptac promoter and MBP translation initiation signals control expression of the gene. Upon induction, this system fuses the target protein sequence with a portion of MBP to create a fusion protein that is isolated using amylose affinity chromatography. Different pMAL vectors permit fusion proteins to be secreted into the periplasm or produced in the cytoplasm, and each introduce a protease cleavage site between MBP and the target protein to facilitate tag removal. 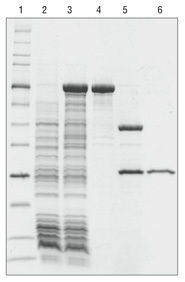 MBP fusion proteins can also be expressed in yeast. The pKLMF-series vectors permit intracellular expression of MBP fusions in the yeast Kluyvermyces lactis. These vectors stably integrate into the host chromosome and utilize the strong yeast LAC4 promoter for expression. Both vectors also introduce a protease cleavage site between MBP and the target protein. pMAL™ is a trademark of New England Biolabs, Inc.